For the Japanese movie, see Patriotism (film). 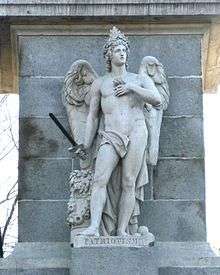 Allegory of Patriotism at the Monument to the Fallen for Spain in Madrid (1840), by sculptor Francisco Pérez del Valle. Patriotism is an emotional attachment to a nation which an individual recognizes as their homeland. This attachment, also known as national feeling or national pride, can be viewed in terms of different features relating to one's own nation, including ethnic, cultural, political or historical aspects. It encompasses a set of concepts closely related to those of nationalism. An excess of patriotism in the defense of a nation is called chauvinism; another related term is jingoism. The English term patriot is first attested in the Elizabethan era, via Middle French from Late Latin (6th century) patriota, meaning "countryman", ultimately from Greek πατριώτης (patriōtēs), meaning "from the same country", from πατρίς (patris), meaning "fatherland". 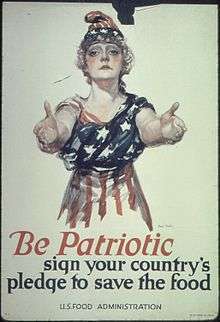 The abstract noun patriotism appears in the early 18th century. Enlightenment thinkers also criticized what they saw as the excess of patriotism. In 1774, Samuel Johnson published The Patriot, a critique of what he viewed as false patriotism. On the evening of 7 April 1775, he made the famous statement, "Patriotism is the last refuge of the scoundrel." James Boswell, who reported this comment in his Life of Johnson, does not provide context for the quote, and it has therefore been argued that Johnson was in fact attacking the false use of the term "patriotism" by contemporaries such as John Stuart, 3rd Earl of Bute (the patriot-minister) and his supporters; Johnson spoke elsewhere in favor of what he considered "true" patriotism. However, there is no direct evidence to contradict the widely held belief that Johnson's famous remark was a criticism of patriotism itself. Patriotism is the will of the members of a country to support the country and help it continue. Craig Calhoun, Is it Time to Be Postnational?, in Ethnicity, Nationalism, and Minority Rights, (eds.) Stephen May, Tariq Modood and Judith Squires. Cambridge: Cambridge UP, 2004. pp 231–256. Paul Gomberg, “Patriotism is Like Racism,” in Igor Primoratz, ed., Patriotism, Humanity Books, 2002, pp. 105–112. ISBN 1-57392-955-7. Alasdair MacIntyre, 'Is Patriotism a Virtue? ', in: R. Beiner (ed. ), Theorizing Citizenship, 1995, State University of New York Press, pp. 209 – 228. 1 2 Historical Dictionary of the Enlightenment - Harvey Chisick - Google Books. Books.google.com. Retrieved 2013-11-03. ↑ "Nationalism (Stanford Encyclopedia of Philosophy)". Plato.stanford.edu. Retrieved 2013-11-03. ↑ "Patriotism (Stanford Encyclopedia of Philosophy)". Plato.stanford.edu. Retrieved 2013-11-03. ↑ "Henry George Liddell, Robert Scott, A Greek-English Lexicon, πατρι-ώτης". Perseus.tufts.edu. Retrieved 2013-11-03. ↑ Billig, Michael. Banal Nationalism. London: Sage Publishers, 1995, p. 56-58. ↑ Christopher Wellman, Professor of Philosophy at Washington University in St. Louis, and Professorial Research Fellow at Charles Sturt University in the Centre for Applied Philosophy and Public Ethics. 1 2 Wellman, Christopher Heath (2014). Liberal Rights and Responsibilities: Essays on Citizenship and Sovereignty. New York: Oxford University Press. pp. 32, 50. ISBN 9780199982189. ↑ "Communist Manifesto (Chapter 2)". Marxists.org. Retrieved 2013-11-03. ↑ Archived December 10, 2014, at the Wayback Machine. ↑ Motyl, Alexander J. (2001). Encyclopedia of Nationalism, Volume II. Academic Press. ISBN 0-12-227230-7. ↑ Morse, Adair. "Patriotism in Your Portfolio" (PDF). Journal of Financial Markets. U of C 2008. 14 (2): 411–440. doi:10.1016/j.finmar.2010.10.006. Archived from the original (PDF) on November 25, 2011. ↑ "11 - Is it time to be postnational? - University Publishing Online". Ebooks.cambridge.org. Retrieved 2013-11-03. ↑ "George Orwell: Notes on Nationalism" (in Russian). Orwell.ru. Retrieved 2013-11-03.